Firefighters in Greater Manchester have been given body cameras after a rise in attacks, the fire service has said. There have been 10 attacks - including three on Tuesday night - in the past four weeks, the Manchester Evening News reports. 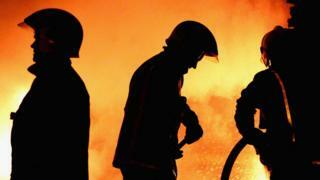 Crews in Bolton were given bodycams in the past week, said Lee Coleman from Greater Manchester Fire and Rescue Service. "It is sad that we have had to take this course of action," he added. Between April 2015 and August 2017, there were 152 reports of attacks on firefighters in the service, ranging from assault to verbal abuse. Mr Coleman said fire crews attended two deliberate fires in Westleigh, Wigan, last week where they were "attacked by youths, who threw bricks and stones at them and the fire engine". He said the decision to give firefighters body cameras was "as much for the personal protection of the crews as recording evidence". Ian Read, watch manager at Bolton Central, said he felt "angry" after a colleague got hit on the side of the head with a brick when some offenders set fire to rubbish under a bench. "Luckily he was wearing his helmet with his visor down. If it had hit him in the face it could have blinded him. "I have worked in some of the toughest areas - Salford, Broughton and north Bolton - and incidents like this had begun to stop. It is horrible to see them coming back again." Greater Manchester's Deputy Mayor for Policing and Crime Beverley Hughes said: "These attacks take up the extremely valuable time and resources of our emergency services and will not be tolerated." Since 2016, firefighters in the West Midlands and Hampshire have also been equipped with cameras.